Editor’s Note: This is a case study originally ran in MASONRY, because this case study project relied heavily on design to complete the restoration, we felt it was important to share in MASONRY DESIGN readers as well. Master builder John Weaver and a handful of farmers built Rohrbach’s Bridge over Antietam Creek in 1836. They built the creamy white stone bridge with three magnificent barrel arches and elegant proportions: 14 ft. 9 in wide and 125 ft. long. They made wood-capped parapets atop the structure of limestone sourced locally from there around Sharpsburg, Maryland. Their work provided an architectural focal point worthy of lingering upon. Then, as now, mossy bridge walls accentuated surrounding verdant fields and the green creek flowing below. In such an idyllic setting, how could Weaver and the farmer/builders have known that, just decades later, the bridge would help shape the country’s history? That it would flood the creek’s name, Antietam, with such a powerful connotation? That the river beneath would flow red on the bloodiest day of battle on American soil? 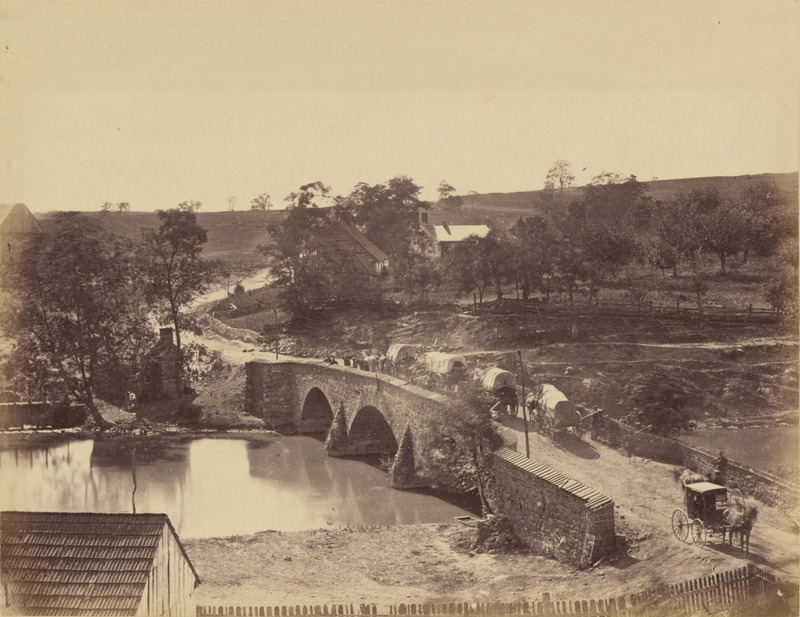 For it was there, at the Battle of Antietam, during the Civil War when, for three hours, 500 Confederates prevented Major General Ambrose Burnside’s Federals from crossing the river. But it was more than a Civil War relic Witmer Restoration restored. That bridge went on to serve traffic until 1966. It is also part of the National Park Service and has a place on the National Register of Historic Places. Burnside Bridge was starting to show its age, though. It had over gone a handful of minor repairs over the centuries since it was erected. 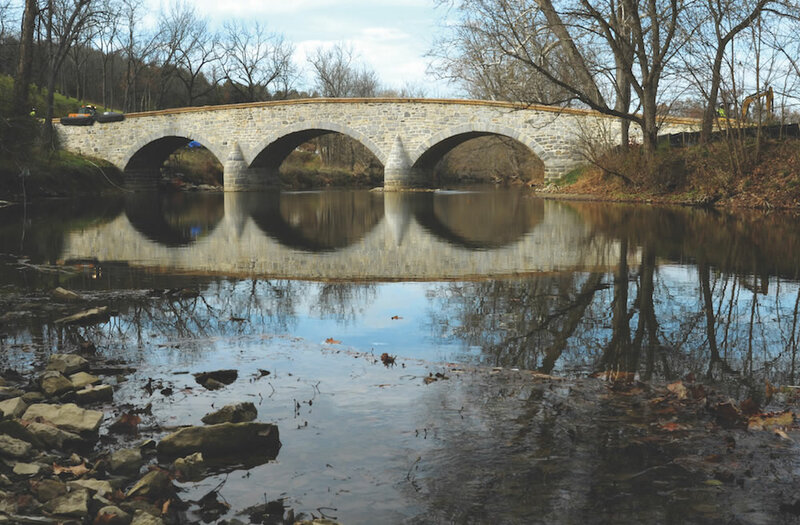 When a large section of stone facing fell into Antietam Creek in 2014, though, the National Park Service Historic Preservation Training Center gave it a deeper inspection. Preservationists and engineers found this would take more than a cosmetic touch up. The walls suffered from substantial deterioration. Water infiltration in the piers had caused structural instability. 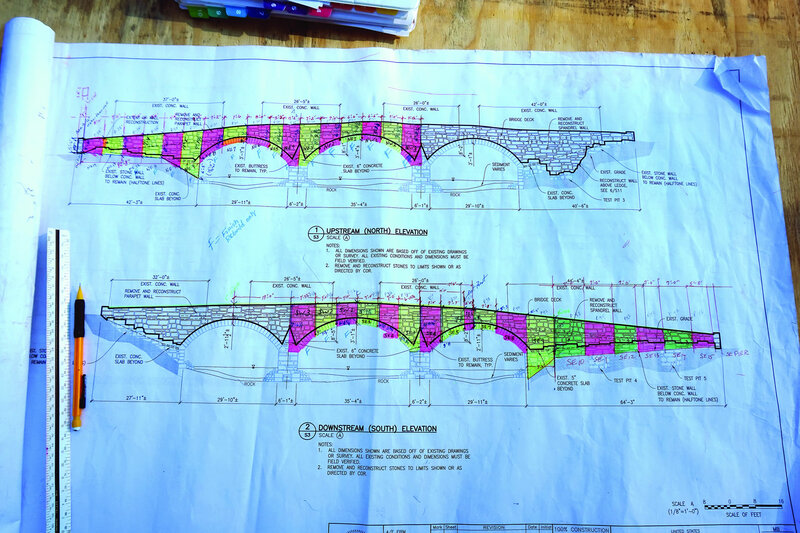 The Historic Preservation Training Center’s preservationists devised a two-phase restoration plan: in-stream work on the stone piers and arches, followed by selective dismantling and rebuilding of large sections of the bridge walls. The price tag? $1.7 million, plus months of limited-to-no access for site visitors. They brought on the Witmer Group, a firm that provides restoration and masonry work, among other services, from its home in Mount Joy, Pa. The multiple challenges were apparent straightaway, according to project manager Kenneth Oatman, though more popped up along the way. Challenge number one: they needed to build cofferdams and relocate them as work progressed to create a dry, safe work area. Challenge number two: underpin deteriorated footers before moving forward. Challenge number three: they had major repairs along the undersides of the arches, where large cracks and major voids revealed themselves to be larger than previously unrealized. Challenge number four: the crews faced a materials shortage though they still had to dismantle and rebuild the bridge’s stone facing. How they got the work done between October 2015 and December 2016 is a story they might be telling for a long time to come. Attacking the first challenge first, Witmer crews created a safe, dry work area by building cofferdams, relocating them time and again as work progressed down the bridge’s expanse. They also draped metal skeleton frames with heavy-duty waterproof canvas and secured them with sandbags. Then it came time for the water pumps. The design called for seepage through sediment, necessitating the addition of seven pumps. Though because they would provide high pressure washing in preparation for repointing and then again to facilitate cleaning, these pumps proved more than useful. After initial adjustments, they remained intact– with one exception. The winter of 2015/16 brought a heavy local storm that deposited three feet of snow. The snow melting afterward made the creek water rise rapidly. It flowed at a rate of almost 1,000 cubic feet per second— between four and five times faster than the river’s typical flow of 200 cubic feet/second— and overtook the nearby dam. Soon enough, as water began to recede, the pumps came in handy yet again. Accentuating the work of Mother Nature, crews helped pump the creek dry, which helped them get quickly back on schedule. Though when the footings were fully exposed, workers easily felt stuck in the classic game of “That’s Good– No, That’s Bad.” Now they found severe deterioration that would require underpinning. But they are always up to the task. And so they dug trenches around the piers and lined them with sandbags. This gave them the opportunity to form the base of the piers with eight cubic yards of poured concrete on each new footing, and fortify them with epoxy-coated rebar. ‘Round about this time, some careful forethought led to an innovation. They were able to predetermine the layouts for future scaffolding. That is, workers poured bases in a foot-deep grid pattern on bedrock. Months later, with the dams were removed, they could erect scaffolding securely into those bases. Concrete scaffold bases were likewise removed when the job was complete. Now it was time to internally stabilize the piers. This require working with a natural cement grout, an inherently expensive and difficult to find material. It was also challenging to effectively inject the stuff into hidden, uncharted empty spaces (such as the pier cracks) as flowable fill. They did so by dividing the piers into two lateral segments: the first from the footing to approximately half-way up the spring line; the second ending at the bottom of the existing concrete slab (as a part of previous repairs, concrete slab had been added to support the roadway). They piped grout into ports until it was forced out of exit ports above. Then they sealed the lower ports and repeated the process in the upper section. Crews had removed the concrete slab, which rested on the piers below, in order to add one-inch threaded stainless steel tie rods for additional structural support. They poured a new slab to encase the new and existing tie rods. With new footings, with flowable fill stabilizing every crevasse, and with the added tie rods, the piers’ long-term structural integrity was assured. Pier work was now complete. It was time to turn to the bridge’s arches. One barrel at a time and simultaneously on both sides of the bridge, crews erected scaffolding. This allowed them to get a closer look at the undersides of the arches. There they found cracks far larger than anticipated– and large voids in the wall, some one to two feet deep. They sprang to immediate action. Using gravity and natural lime mortar to fill the voids and stabilize the cracks, they introduced a variety of stone sizes into cavities. They spiraled helical rods to tie everything together. After they had filled the voids, and completed the face-pointing, team members hand-pumped grout into PVC tube ports. The grout had the consistency of molasses, which helped to fill voids as small as ⅟₁₆” because it was so easily able to to seep across sides and meet piers. Once this procedure was complete, the team dug up the top side of the bridge in order to install additional 1” stainless steel tie rods over each vault. They poured grout into the top of the vault, followed it up with flowable fill for under-deck areas, and later topped it with gravel and a new paving surface. In the next phase crews focused on dismantling and rebuilding stone facing. This entailed keeping the stoned in as close to original order as possible, not betraying the prolific work done to restore the bridge. The goal– and challenge– was to create a finished product that would be barely discernable from the original. Work crews had already removed and cleaned the majority of facing stones. 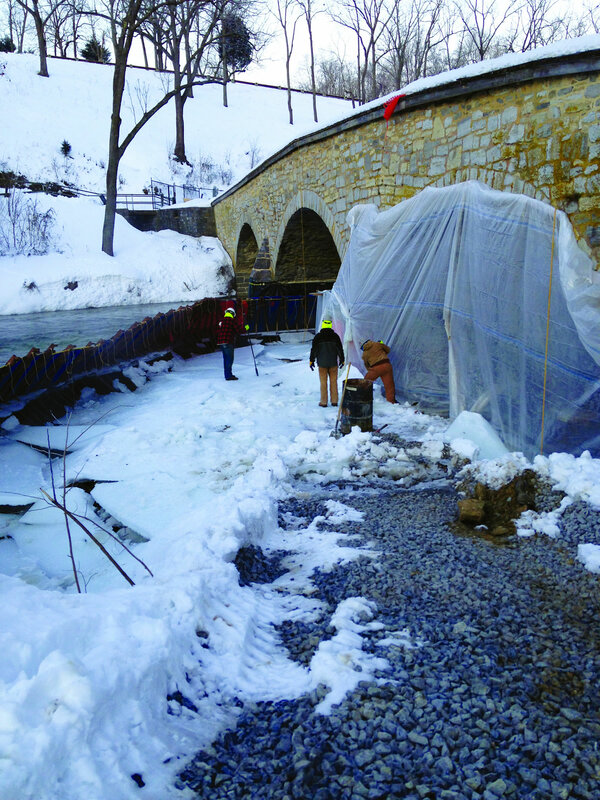 They removed the deteriorated material immediately behind, placing nets across the scaffolding to capture virtually all the debris, protecting creek waters below. They used corrugated tie anchors epoxied into interior stones to build upon stability, and then replaced facing stones into their original configuration using carefully detailed charts. Witmer Restoration’s team devised a system that divided and marked the project into vertical numbered segments, allowing them to create an accurate map. Crews hung poly sheets, outlining each stone, numbering character stones on both map and stone faces. A duplicate copy of the map was created and laid on the ground, onto which stones that had been extracted would be temporarily placed. Of course, at this point the crews were about due for another challenge. And they got one: a materials shortage. It seems a strike in France, the source of the natural lime mortar, made the stuff suddenly unavailable. Re-sourcing the unique formula required careful, extensive research. Again Witmer rose to the challenge. Though it still wasn’t out of the dark. Near the end of the project the sand that had been allocated was depleted. After visits to several suppliers and the project foreman’s expert mixing, a new combination of three sands was formulated to match the original mixture. 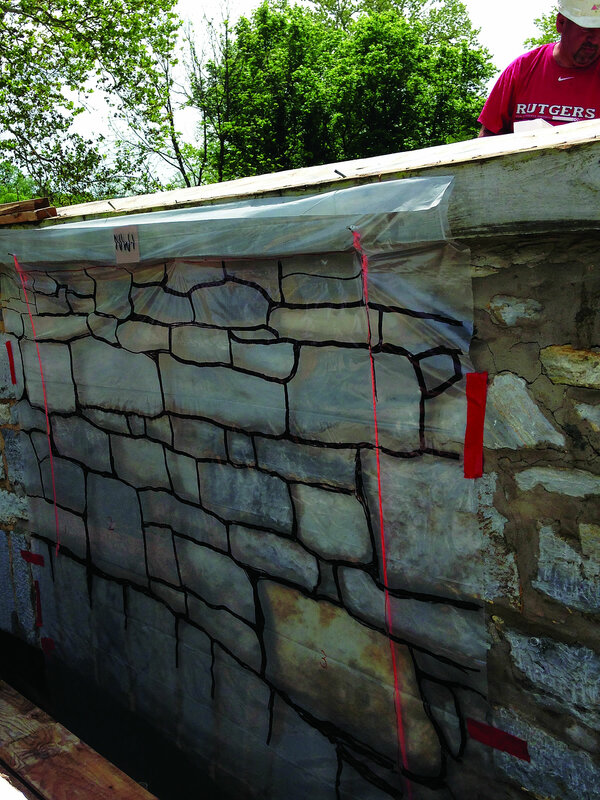 Finally, coming to a close on the project, crews added a natural lime mortar wash atop the parapets in preparation for a waterproof membrane, stainless steel pan flashing system, and finally an oak shake cap system at the parapets to match the original design. Witmer’s masonry division’s contribution to this significant historic project included repointing of the abutments, piers, and arch soffits, underpinning of existing footings, grout infill of pier voids, introduction of stainless steel tie rods, and the dismantling and rebuilding of parapets and spandrel stones. Along the way came some challenges and some innovations, matters of opportunity and necessities of invention. But that’s all in a day’s work. The bridge reopened to National Park Service visitors in December 2016. It’s a shining example of what craftsmanship, skillful planning/adapting, and innovative problem-solving can achieve, Oatman says. Burnside Bridge continues to honor the extraordinary losses of the Civil War but also the craftsmanship and aesthetic prowess of its designer, Weaver. For Witmer it was a learning experience– and a patriotic duty– to preserve the integrity and history of the landmark that stands as solid as America.